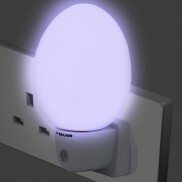 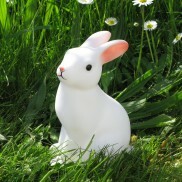 Cast a warm white glow into your child's room at night from the adorable Little Baby Bunny Night Light. 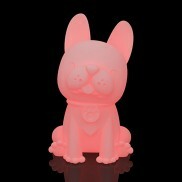 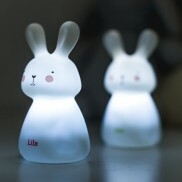 A battery operated LED night light, this cute little bunny will help to reassure your child at night. 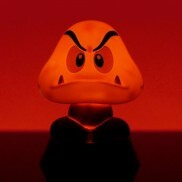 An iconic character from gaming favourite Super Mario Bros, this Goomba shines with a comforting glow! 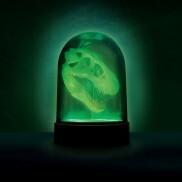 A glow in the dark specimen T-Rex skull shines from within this fun lamp, even after the lamp has been switched off! 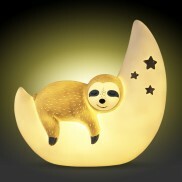 A warm and cosy lamp for kids rooms, a sleepy sloth dozes on the moon shining with a beautiful comforting glow. 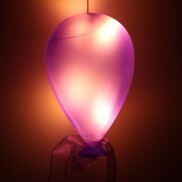 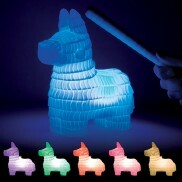 Bright, colourful and playful, this sweet pinata mood light changes colour everytime you tap it with it's whacking stick! 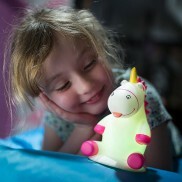 Get a good nights sleep with Twilight Turtle at your bedside! 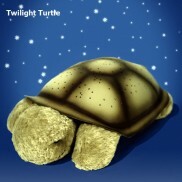 Twilight Turtle lights up in your choice of three soothing colours and projects stars onto the walls and ceiling. 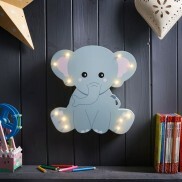 A cute and colourful character for kids rooms, this adorable sloth light oozes with feel good vibes! 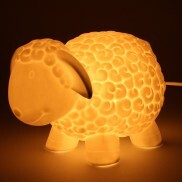 An automatic LED sensor night light that turns on when it senses darkness to provide a soft comforting blue glow for your child at night. 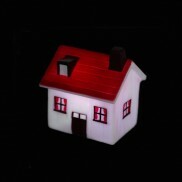 The Dome Automatic Nightlight is a plug in nightlight that's ideal for kids rooms. 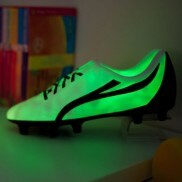 If your child goes to sleep dreaming of shooting the winning goal at Wembley, they'll love this football boot night light! 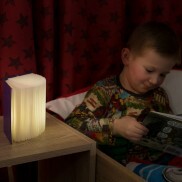 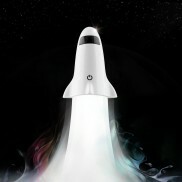 Make bedtime an adventure with gentle white light from this rocket lamp and torch in one! 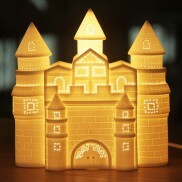 Fill your child's room with a magical glow from this stunning ceramic fairytale castle lamp. 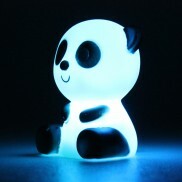 Soothe little ones at night with a colourful light show from this cute mini panda night light. 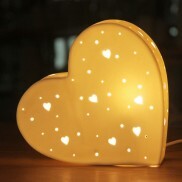 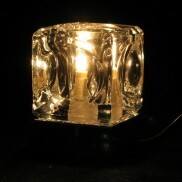 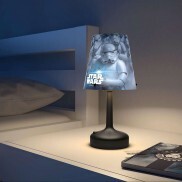 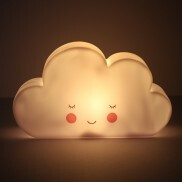 A sweet little cloud night light with a warm white glow for extra reassurance at night. 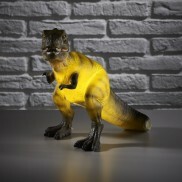 Bright, colourful and full of fun, this adorable dinosaur mood light stands at an impressive 26cm tall! 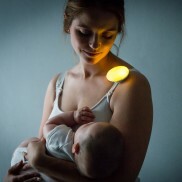 A wearable soft glow night light that's dimmable too, the Meelight is ideal for feeding and changing babies at night shining with a gentle, unobtrusive glow. 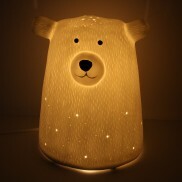 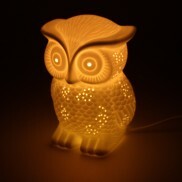 This adorable bear may not be cuddly, but he's very cute and offers a warm and comforting glow at night. 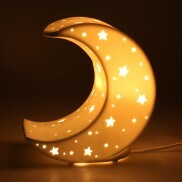 An excellent choice of nightlight for older children as it has a four stage touch dimmer control located on the chrome base for easy activation throughout the night. 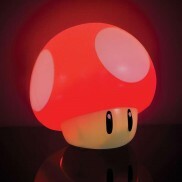 A favourite icon from Super Mario Bros games, this adorable mushroom light shines gently to reassure young gamers at night. 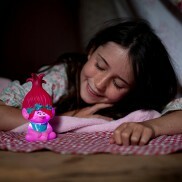 Shine a light with MyLight, a motion activated light that illuminates from beneath the bed with a soft guiding glow. 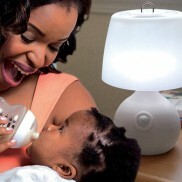 Take care of your baby's night time needs without disturbing them with brighter over head light with a motion sensitive soft light nursery light. 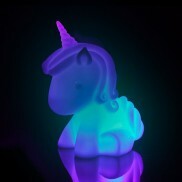 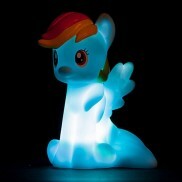 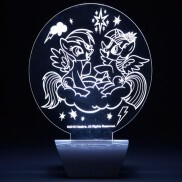 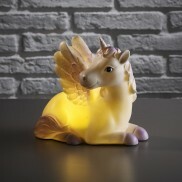 Illuminate your favourite My Little Pony characters with colour change light in this sweet acrylic night light. 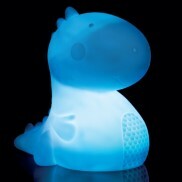 A cute character to brighten up your child's room, this sweet dino is lit with warm white LEDs. 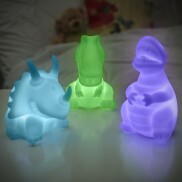 Illuminate your child's room with a colourful glow from a trio of adorable mini dinosaur night lights. 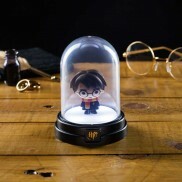 Add a touch of magic to kids rooms with this enchanting Harry Potter mini bell jar light. 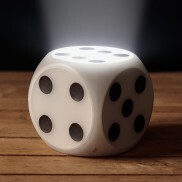 From a subtle night light to a brighter table light, choose the level of lighting in your child's room with the roll of a dice! 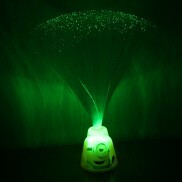 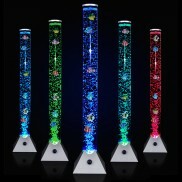 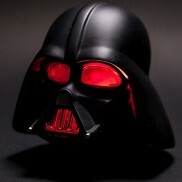 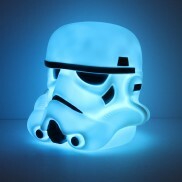 Colourful fibre optics create a spray of colour change light illuminating the Minions base to make a fun night light. 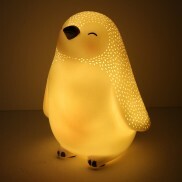 An adorably sweet little penguin light to shine warm, comforting light into your child's room at night. 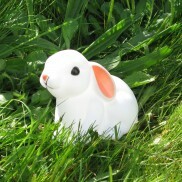 A delightful night time pet that your child will love, comfort your little one with soft light at night from this charming Woodland Rabbit LED Night Light. 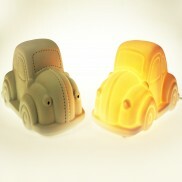 Add vintage style to your child's room with these adorable Bunny Baby Lamps available in white, baby pink and baby blue. 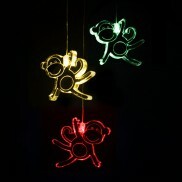 Three little monkeys are lit by colour change LEDs to shine with a soothing, colourful glow from this light mobile. 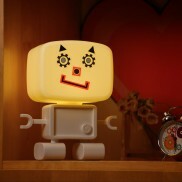 Time for bed? 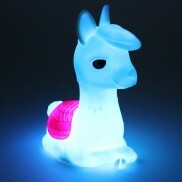 Alpaca my night light! 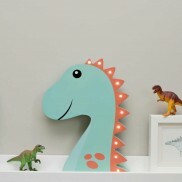 Dino mad kids will adore this textured T-Rex dino lamp that shines with a comforting warm white glow. 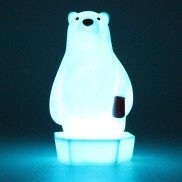 Soothe reluctant sleepers at night with an adorable polar bear night light that shines with a colour change light show. 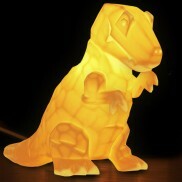 Dino fans will adore this jurassic night light as this T-Rex lamp shines with a reassuring warm white glow. 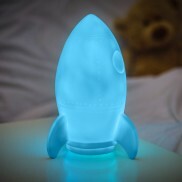 The sky's the limit for your child's imagination and this rocket night light will offer comfort as they dream of the stars! 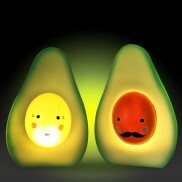 Avocuddle with your little one and give the extra reassurance of soft light at night from this adorable pair of Avocado lights! 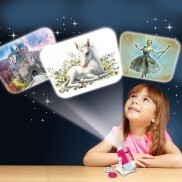 Project enchanting fairytale images up to 1m wide in kids rooms and make bedtime magical with a fairytale projector and night light! 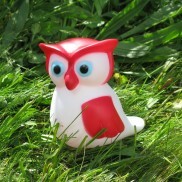 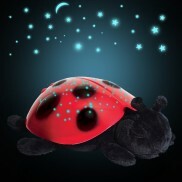 This cuddly lady bird has a tough plastic shell that lights up in three colours and projects stars and constellations on your walls and ceilings and makes a superb nightlight. 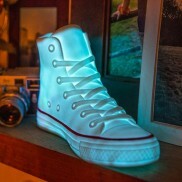 With white light and colour change modes, this Sneaker Lamp is ideal for older kids rooms. 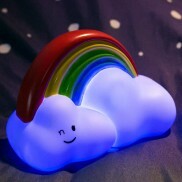 Reassure children at night with a colourful rainbow night light for cheerful bedtimes. 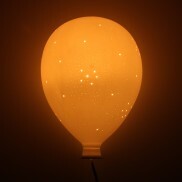 A lovely night light or visual aid for children, the sensory LED bubble lamp will encourage concentration with its realistic swimming fish and colour changing water. 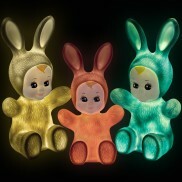 A trio of adorable little bunny night lights that allow you to illuminate a pathway to reassure little ones on the move at night. 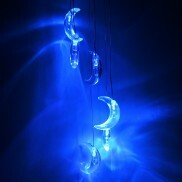 Six crescent moons cast soft and reassuring blue light from this stunning light mobile. 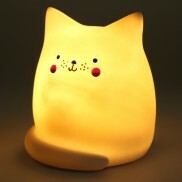 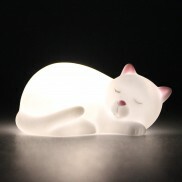 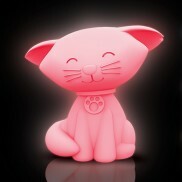 Lit by a soft white LED, this snoozing cat shines with a gentle glow to help reassure little ones at night. 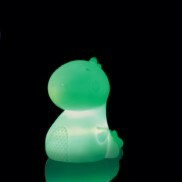 A playful mood light with a prehistoric twist, this colour change dinosaur light is more sweet dreams than Jurassic World! 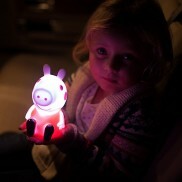 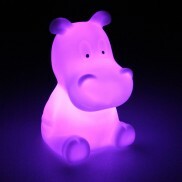 A playful night light for kids, this sweet little hippo is lit with colour change LEDs for a soothing, comforting light show. 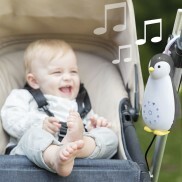 Perfect for kids on the go, this sweet penguin music box plays soothing sounds, is a wireless speaker and a night light too! 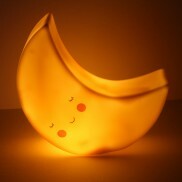 Reassure little ones at night with a gentle glow from this friendly little moon night light. 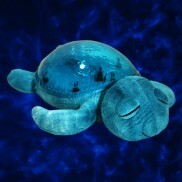 Soothe little ones to sleep with calming ocean sounds and a stunning underwater light effect with the Tranquil Turtle cuddly night light. 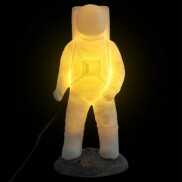 This friendly space explorer shines with a warm white glow to see off the dark of space at night. 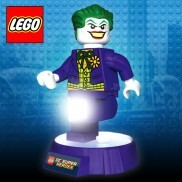 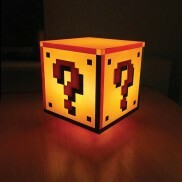 This question block lamp from Super Mario Bros won't deliver a power up or coins, but it will give the bonus of light everytime! 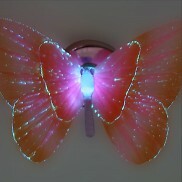 Colour change LED battery powered night light to emit a warm and calming glow in your childs bedroom so they can relax and fall to sleep. 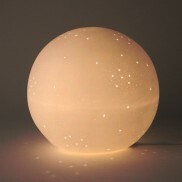 A beautiful full moon styled globe lamp with stunning detailing that's illuminated with a comforting warm white glow. 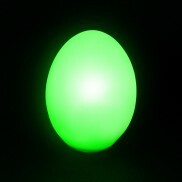 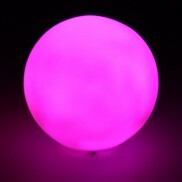 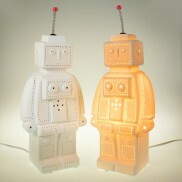 Illuminate kids rooms with an enchanting colour change light show from this versatile little ball mood light. 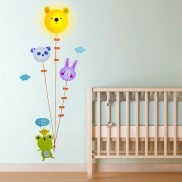 Hang playful balloon lights in your child's room for a splash of colour and a gentle glow. 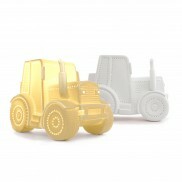 This adorable tractor looks just as at home in your child's room as on any construction site or farm! 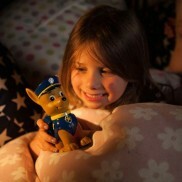 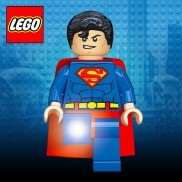 Superman uses his super powers of light to give your child comfort and reassurance at night! 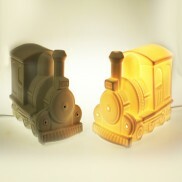 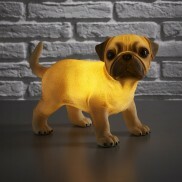 Train mad kids will adore this stylish porcelain train night light that fills their room with a gentle, warm glow. 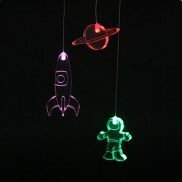 Settle your little one to sleep in the soft colourful light from the Spaceman Mobile. 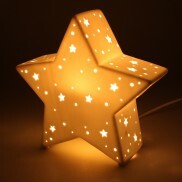 This super cute mobile changes colour for a wonderfully soothing light show that’ll ease baby or even older children gently to sleep.